Press Release (ePRNews.com) - HONG KONG - Jan 25, 2018 - Reolink expands wire-free home security products lineup to launch new wire-free rechargeable battery & solar-powered security camera Reolink Argus™ 2 after a successful launch of award-winning Reolink Argus™ on Indiegogo. The new security camera features a long-lasting rechargeable battery, solar powering, starlight night vision, high-quality 1080p Full HD, smart PIR motion sensor, live streaming video with 2-way audio, and weatherproofing, making Reolink Argus™ 2 a perfect surveillance solution for home, apartment, small business, workplace, warehouses, parking lots, construction job sites, vacation homes, rental property, RVs, marinas, farms, and stables. The new Reolink Argus™ 2 supports flexible powering options. It is packed with a long-running rechargeable battery (supports up to six months on one charge), making it flexible and hassle-free to place almost anywhere consumers want to keep an eye on. The weatherproof Reolink Argus™ 2 can also be hooked up to Reolink Solar Panel via Micro USB cable to be continuously charged and get non-stop power supply. Another innovative feature of Reolink Argus™ 2 is the starlight color night vision powered by Sony highly-sensitive image sensor, which gives users the valuable visual details to better identify people, vehicles, and other details day and night. It captures truly 1080p HD crisp and sharp videos and offers up to 33ft night vision. With built-in 130° wide-angle and highly sensitive PIR motion sensor, Reolink Argus™ 2 detects human movement, sends real-time motion alerts (app notification and email), triggers siren alarm and records to inserted Micro SD card. 100% Wire-Free: No cables or wiring hassles. Place and move anywhere outdoors and indoors; works independently. Rechargeable Battery: Long lasting power per charge of the battery; saves your money. Solar Powered: Connect the camera to Reolink Solar Panel to get non-stop power. Starlight Night Vision: Clearer night vision even in the dark, up to 33 feet. 1080p Full HD: Get crystal and sharp videos/images with true 1080p Full HD. PIR Motion Sensor: Smart PIR sensor detects if anything is wrong and triggers alerts. Alerts & Siren: Get push notifications, emails, and siren alerts in real time. Two-Way Audio: Built-in mic & speaker to listen in and tack back interactively. Weatherproof: It’s weatherproof and works well even in harsh conditions, rain or shine. 130° Wide Viewing Angle: a wider field of vision to cover more and see more. View on Smartphone Anytime Anywhere: Get a remote live view via smartphones anywhere & anytime. Motion-Triggered Record (Optional): Insert a Micro SD card to get motion event recording. No monthly fees. Rapid Wake-Up: Wake up at once for live view or motion event detecting. Easy & Flexible Installation: Mounts and skins to help Reolink Argus 2 blend in any placement. Reolink Argus™ 2 100% Wire-Free Rechargeable Battery Camera ( the rechargeable battery included) is now available for $129.99 globally. 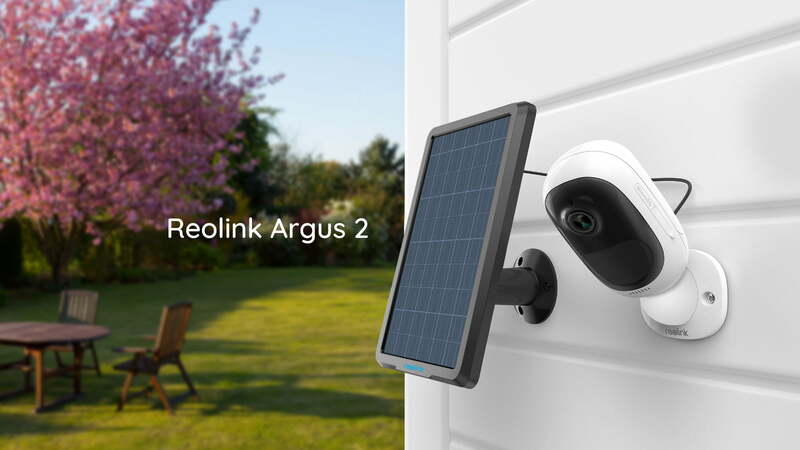 The Reolink Solar Panel for Reolink Argus™ 2 Security Camera is available for $29.99. All orders on Reolink website are shipped free of charge and covered by Reolink 2-year limited warranty. Reolink offers many reliable & high-quality security cameras and systems for home and business, including wire-free security camera Reolink Argus™, PoE security cameras and systems, wireless security cameras and systems.